If you are looking forward to trying the hobby of metal detecting, there is a product available here that is perfect for the beginners. This great hobby can yield some very rewarding results. You never know what you can find on your outings, especially with the right equipment at hand to make sure you don’t miss any precious find. As a beginner, you will probably be looking for a reasonably priced, easy to use, but decent quality product. Garrett Ace 300 Metal Detector meets all these requirements with ease, so read on to learn more about this great metal detector. Garrett ACE 300 metal detector combines high quality and affordable price, so if you are looking for a tool to start the hobby, Garrett ACE 300 is probably the best choice. This Garrett ACE 300 review reveals all details about the tool. The Garrett Ace 300 is an excellent detector for beginners and even the more advanced users. This device offers an excellent potential detection depth (but depends much on the material being scanned), sturdy and hard wearing design (which ensures that your device stays functional even after a scrape or two), and very easy to assemble and operate (so even total newbies will be able to get up and running in no time at all). You get all these features, but the cost of the tool is absolutely on budget. 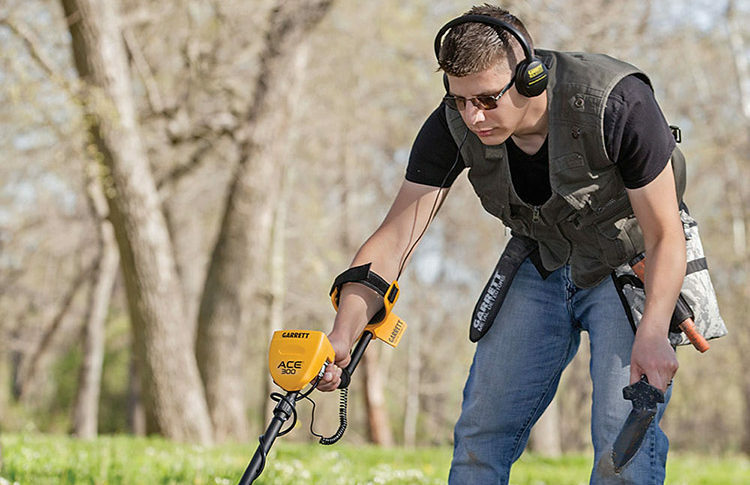 So, take a deeper look at the features of the Garrett Ace 300 metal detector. The Garrett Ace 300 metal detector is a really great tool. And thanks to the cutting edge technology, it is considered one of the most efficient metal detectors in the industry. It has many useful features, including one touch treasure hunting, five search modes, a continuous depth indicator, and pinpoint targeting. With pinpoint targeting, you have the ability to accurately determine the location of a specific target. This feature works best when used in sand or gravel. In order for the pinpoint feature to function properly, you have to set the search coil to the loudest possible signal. Once there, push and hold the pinpoint button. You are now in pinpoint mode. Start sweeping the ground. Make sure the metal detector is not too close to the ground. Keep it at a consistent height while you sweep. Once the metal detector is right above the target, it will notify you. The target ID light will turn on and the LCD will show at least 5 bars. Now let’s talk briefly about the detection modes. As it has already been stated before, the Garrett Ace 300 comes with 5 search modes: all metal, coins, relics, jewelry and custom. In custom mode, you are able to control the notch discrimination and target ID settings. All metal mode can detect all sorts of metals and can be used when searching for different types of targets. Jewelry mode will detect jewelry, coin mode will detect coins, and relic mode will detect things such as brass and lead. Another great feature about this the Garrett Ace 300 is that it was created with your comfort in mind. You can adjust the shaft and armrest to a position that is comfortable for you. There is also a headphone jack so you can accurately distinguish the tones. This way you know if something is worth your time, or is just a piece of trash. Once you find a treasure, please make sure you dig it out safely. You don’t want to damage the target before you retrieve it. The Garrett Ace 300 owner’s manual suggests you use the C-Cut method. This basically means you will use a knife to cut a “C” around the target. Pull up the dirt and extract the target. Once you have the target you will need to put the removed ground back in place. Overall, the Garrett Ace 300 is a great metal detector. It is perfect for those who love to go out on the beach and search for those lost treasures. Electronic Pinpointing: this allows you to be very precise with your location, which will reduce the digging time and improve the hit rate. Accept/Decline Discrimination: allows you to modify the discrimination patterns that the device recognizes. 4 Search Modes: All Metal, Jewelry, Custom, Relics, Coins and Pinpoint. Allows you to target certain popular materials in your search; improves accuracy and success rates. These modes give you a varied and diverse search pattern, so no matter what you are looking for, you will find it. Continuous Coin Depth Indicator: will allow you to determine your target depth more accurately to aid the recovery. Battery Condition Indicator: continuous monitoring of the battery life. Interchangeable ACE Series Search Coils: various coils are available depending on the type of search you intend to do. Expanded Target ID Legend: this is an easy to read panel above the display screen on the device. Pushbutton Controls: single touch operation allows to easily change the settings. The metal detector can also be disassembled into three easy to manage pieces not longer than 24 inches in length. There is a 0.25 inch audio jack for headphones to be inserted. There is also an adjustable arm cuff for a more comfortable fit. Pin-pointer. The pin-pointer will allow you to get a very accurate location on the find you have discovered with your Garrett Ace 300. With this accurate location, you can minimize the amount of digging you need to do. Imagine digging a hole the size of a coin, instead of 10 inches hole. This will save you a lot of time and energy, and will be a great supplement to your metal detector. It has a PROformance DD 8.5 inch x 11 inch search coil. This double D coil makes it easy to operate the metal detector in the toughest ground conditions. Another great feature not mentioned above is enhanced iron resolution. 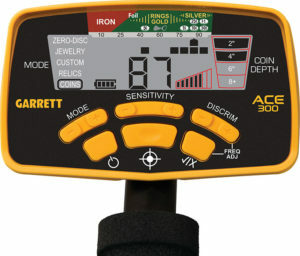 The Garrett Ace 400 metal detector is able to better discriminate iron targets. It has a wide iron range and can easily identify different types of iron. It can literally distinguish it among other metals. This means those searching for jewelry and coins will get better results. With enhanced iron resolution, you will dig out less trash. Moreover, if you are searching for older targets that lie deep under the ground, this metal detector will help you find them. With the Garrett Ace 400, you can easily identify valuable targets. Moreover, it doesn’t matter whether you are looking for small, medium or large iron targets, you can find it with this tool. The Garrett Ace 400 also has a higher frequency of 8.25 kHz. This higher frequency enables the tool to search out highly conductive targets such as gold, with ease. Other great features of this machine include electronic pinpointing, five search modes, battery condition indicator, continuous coin depth indicator, push button controls, and interchangeable ACE series search coils. The five search modes are jewelry, custom, relics, coins and zero. So, as you can see, the 400 is packed with a ton of features. It is a great metal detector for beginners and more advanced searches alike. If you want to introduce your kids to metal detecting, this is a perfect metal detector for this task. In addition, with its 15 to 20 hour lifespan, you can be out on the beach searching for treasures all day long. If you were planning to buy Garrett ACE 300 metal detector before, for sure that plan has finally become a firm intention after you have found out more about the tool’s features. But this innovative brand does not merely stop there, because there are additional pros that further enhance the unique functions it has. The search coil of this metal detector is combined with rugged durability. This kind of durability is waterproof and is ideal to use even if you are hunting on the beach, or any watered-surface location. Due to innovative technology used for creating the tool, this metal detector both functions and looks like a professional equipment. This device has made use of ACE 300. According to experts, ACE 300 is proven to be great for the optimal metal detection. However, if you really are interested in Garrett ACE 300, there are also some cons regarding the functions of this device that you have to be aware of. It has to be admitted that the benefits really outweight, especially if the tool is compared to models of other brands. It takes some time before the hunters (especially newbies) get used to the signals and will be able to distinguish which signal means what. Hunters should initially have from eight to ten uses of the device before the signal of different sounds it produces can be determined and understood. As you can see, there is some great feedback from the customers who have purchased the Garrett Ace 300. Hopefully, you can see that this device is a very high quality, functionally excellent beginner-to-advanced level detection tool. The quality-to-price ratio is literally unique on the market. If you are new to the hobby, this device is a perfect choice for you.